We continue our series of koi farmer visits to learn about the critical focus and processes each undertakes. 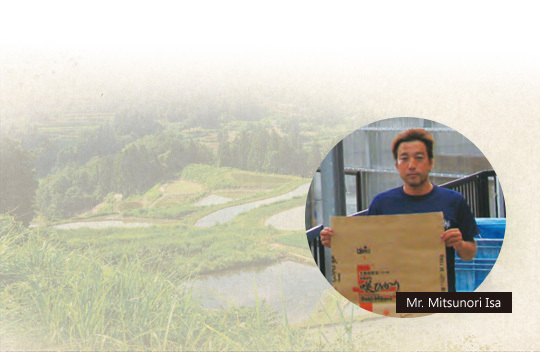 This time we interviewed Mr. Mitsunori Isa of Isa Koi Farm who is famous for its big and powerful Isa Showa whose strongest charm is its eye-catching appearance. The farm is located in the city of Ojiya which is close to the cradle of Nishikigoi, Yamakoshi in Niigata Prefecture. With a long history of 41years, the farm consists of 31 field ponds on approximately seven hectares of land. They focus mainly on Showa (about 70% of their total),Kohaku and Sanke. Until the appearance of Isa Showa, it was believed that the koi of Showa Sanshoku variety were stout and muscular and rarely grew larger than other Gosanke varieties. However, an Isa Showa typically grows to about 80cm in length, while maintaining its superior figure and qualities. The gigantic koi parent Isa breeds is a Maruten Showa of 101 cm, which is a sibling of a koi nicknamed ''Chokansho'' which means the Fisheries Agency Award. 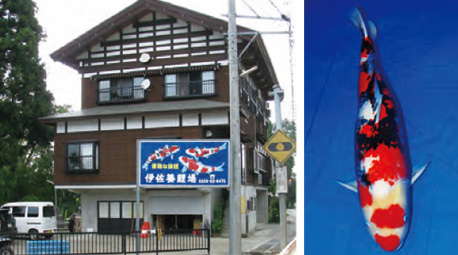 They have been using the jumbo koi parent for more than 10years and its descendants have won the Kokugyo Award several times. The koi parent is still actively spawning. This memorable koi’s strongest charm is its white skin which became conspicuous when the fish was three years old. While maintaining its beauty, the fish grew to 86cm at the age of seven and won the grand championship for the first time. One of the farm's female koi parents a 13 year old,90cm long Showa Sanshoku (“Chokansho”) won the second grand championship (the Fisheries Agency Award) in the 49th Niigata Nishikigoi Show.Mr. Isa intension was to exhibit a superb koi which would surprise every viewer who attended the cradle of Nishikigoi event. He also felt it could be the last koi exhibit for this fish as they had been using the fish as a koi parent for seven years, and its condition was the best within their collection. The fish's lustrous skin looked as if it had been untouched for those years. This fish of sturdy build was producing strong charms beyond words. Many of its offspring have inherited these splendid characteristics. Q.What sort of koi do you intend to farm? Our goal is to produce koi that impress with their natural beauty, power and size. We have established a method to combine bloodlines of koi parents and can now produce excellent quality koi with a powerful appearance. Our next goal is to make the Sumi markings of these koi better as they mature. One of the unique charms of these "moving works of art" is their transformation as they grow, unfortunately it is not always favorable but always creates anticipation of a champion. We devote ourselves to producing a single koi which meets our ultimate ideal. The farm has adopted new breeding techniques and feed selections over time based on first hand use. This year, 2011, they tried using an artificial implantation net. The result was a significant increase in the incubation rate. 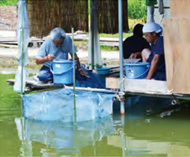 They owe part of their success to their fellow koi farmers, who organized the "Sannichikai" association; Hiroi Koi Farm, Hosokai Koi Farm, Isa Koi Farm, Dainichi Koi Farm, Ooya Koi Farm, Kawakami Koi Farm and Izumiya Koi Farm. These koi farmers exchange information from day to day, working to improve themselves by competing with each other. Q.What do you demand from koi food? As I previously mentioned, we are trying to produce koi with beautiful and powerful appearance. We demand superior quality and dependable food. We selected Kyorin’s diet and are using it as our main food. We are also using Saki-Hikari® Deep Red™ and Pure White™, which were recently added to the Saki-Hikari® series. Saki-Hikari® Deep Red™ and Pure White™? We immediately realized the effectiveness of Deep Red™ as a color enhancer for the Hi and were quite surprised the skin of the fish didn't become yellow. However, we found when we fed it to our young Showa their Hi wasn't enhanced as dramatically as we understand that the nutrition is used for the rapid body growth, and assimilation of carotenoids become slower, even with Deep Red™. We keep 10 to 15 koi of four years old and older in our 10-ton pond as part of their finishing stage. After feeding Pure White™ we found their yellowed skin clearly became a beautiful white. In the past we used to stop feeding for the finishing stage and fish often lost weight as a trade off for the development of spectacular white. We’ve found the use of Pure White™ enables the fish to maintain their body weight and form while improving the whiteness of their skin. As recommended, we use Pure White™ when the water temperature remains low, so generally we have to pay an attention to the amount of food to manage the water quality better. Onze koiafdeling is gesloten van 2 t/m 15 maart ivm onze Japanreis. Schrijf u nu in om op de hoogte te blijven van onze ontwikkelingen. Copyright © 2017 Premium Nishikigoi All Rights Reserved.